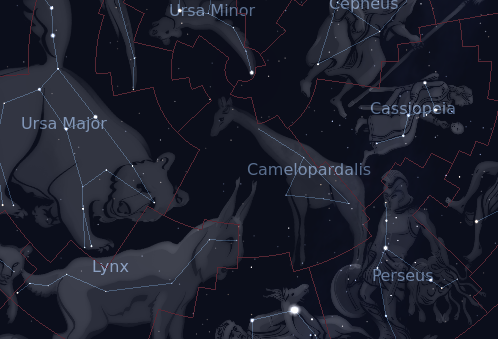 The constellation Camelopardalis. Roll mouse over to see labels. 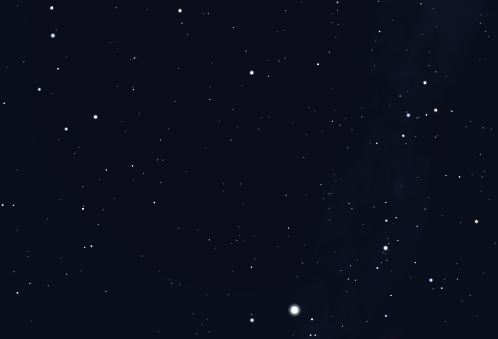 Camelopardalis is a large but faint area of sky close to the north celestial pole. It does not contain any bright stars, and furthermore it also lies well away from the plane of the Milky Way and does not contain any bright deep sky objects either. However, because there is little obscuration from nearby material it is a good place to observe the distant universe, and it contains many faint galaxies. Rather improbably, the name ‘Camelopardalis’ means ‘giraffe’ and was given to this sky area by Plancius in 1612. It had previously been left unnamed by Greek astronomers since it did not contain any bright stars. The giraffe in question is supposedly the animal Rebecca rode to marry Isaac in the Book of Genesis, though the Biblical story itself refers to a camel. Legend has it that Johannes Hevelius saw the spots of a giraffe in the constellation's stars, prompting the association. Camelopardalis contains the following Caldwell objects: C5, C7. The following constellations neighbor Camelopardalis: Auriga, Cassiopeia, Cepheus, Draco, Lynx, Perseus, Ursa Major, Ursa Minor.